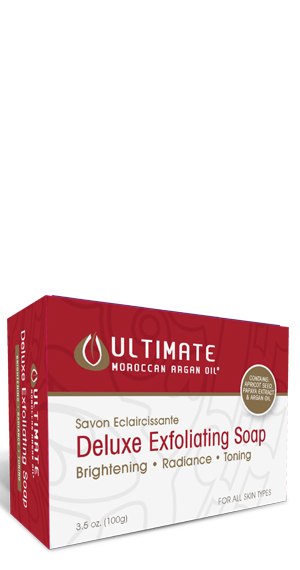 The ULTIMATE Moroccan Argan Oil® Deluxe Exfoliating Soap, formulated with apricot seed, is particularly effective in helping to remove dead skin cells and excess oil that can lead to dull skin and breakouts. This wonderful soap, also helps to brighten your complexion while infusing your skin with argan oil. The ULTIMATE Moroccan Argan Oil® Deluxe Exfoliating Soap combines spa-quality luxury with essential hygiene for maximum skin health and amazing complexion. The high quality ingredients and thick, rich lather provide a pleasing washing experience. Regular use will keep your skin clean, blemish free and visibly brighter and smoother. Work up a rich lather and massage into face and body. Let the lather work for a few minutes before rinsing. Rinse thoroughly and gently towel-dry body while patting face dry. For best results, repeat this routine twice daily.